I am really happy and curios for this beta release after a long time but when i try its disappoint me. look at the images below. Text of active tab get black in active title bar. Its Blur the text of inactive windows text and white box appear active tab in inactive title bar. This is what I get on my system. Its on Windows 10 v1809. And I am no Windowblinds theme. Need to know if you on a Windowblinds theme? Note : Have you try to reboot the system? And reset the Groupy Tab color to default. I am using Windows 8.1 with dark theme v1.17 works great withot any issue with dark and default theme. This is Groupy 1.18 on Windows 8.1 Pro. Its look fine. This is on a Windowblinds theme. I am not sure what theme you are using. If it is Windowblinds please link me to it so I can test it out. But if you're using other 3rd party themer. I can't help you, since we know other themer don't always work with Stardock's product. 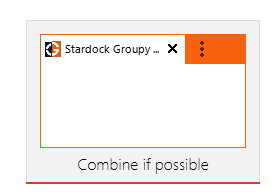 If Groupy 1.17 work for you. I think you should stay with it. By the way when i change theme to the default aero themes of windows 8.1 the inactive tabs text get black exact like your post of windowsblinds pic. If you have hacked your OS theme engine and theme I am afraid we cannot offer any technical support. Groupy is designed to work with the default OS themes and WindowBlinds. Dark explorer support is for Windows 10 1809 and above. I am trying this beta in other windows 8.1 Pc with default theme but its look good only if the title bar is white or any none dark color. the active tab text goes black. i think its happend because the previous version of groupy 1.17 has white layout in active tab and the beta version remove it but forget to change text color. The active tabs aren't white like before. Bug? With my dark blue theme, the black text is hard to read on it. Is that Windowblinds theme? If so what is it name? It's the default Windows 10 theme with a dark midnight blue color. The color isn't normally allowed so I used Winaero Tweaker to force Windows to use it, but using the allowed ones like navy blue didn't fix the problem, and I love this color too much to switch to another. Lol. Downgrading to 1.17 gave me back my white active tabs. 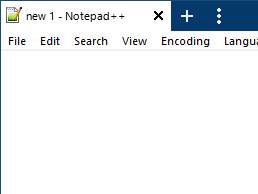 Btw, my Notepad++ looks like this because of the settings I chose (Tab Bar and toolbar hidden, no border edge, etc. ), not because of the Windows theme. I think only Windows dark or light theme and WindowBlinds theme will work. Any other tweaking will not work properly. This looks like a bug. I never experienced this in the prev. versions. Winaero Tweaker forces colors by editing the registry; it doesn't modify the theme itself. Edit: After going back to 1.17, checking for new updates now tells me that there's no update available. Is 1.18 for specific versions of Windows? Mine doesn't have a "dark mode Explorer" and Windows Update tells me it's up-to-date. Yes, I see the problem. I have forwarded the problem to Stardock Support team for their assistance. Please keep an eye on this thread for any updates. We appreciate your feedback and patience. Same problem on Windows 10 1803, downgraded to 1.17 and wait. The problem was notified to the Support Team and pushed forward to Dev. To be fair, the tabs color do have different between active and inactive if you choose different color other than "Orange Bright". With the successful release of Groupy 1.18, I am closing this beta / release thread. If you see any issues that have not been reported here as still outstanding, please create a new thread for them. Thanks again for all your feedback, really means a lot.